Under inflated tires affect a number of things. When you run over rough objects with low pressure (e.g. potholes or sharp rocks) the tire can pinch the inner tube against the rim and puncture it, resulting in a flat (aka. pinch flats or snake bites). Low pressure can also make your bike slower and lose grip while cornering. There’s scientific reasons for this, but there’s also the common sense ones. Imagine rolling an under-inflated basketball vs. one that’s pumped up. Get the idea? The most basic reason for keeping your tires inflated is that they’re designed to work most efficiently and safely at the pressure(s) indicated on the side of the tire. 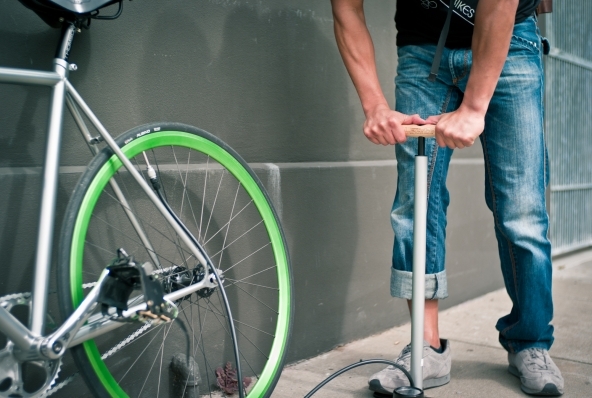 Because tire pressure can drop substantially over time (sometimes over just a few days for road tires with max pressures as high as 120 psi), it’s wise to invest in a good floor pump with a pressure gauge. Get used to what your tires feels like at the right pressure and check them regularly. Just don’t inflate them too much. It’s like popping a balloon, only way louder and more expensive. Nothing feels worse than grabbing a handful of brake and nothing happens. Make sure that your brakes pads are gripping the rim (or rotor on disc brakes) with enough pressure and on the appropriate contact points. Also make sure that your pads haven’t worn passed their limit. They’ll still work, but won’t work as well and might damage your wheels. Almost all your screws and bolts should be at least “hand tight”. The only exceptions are the limit screws on your derailleurs (the mechanisms that sit next to the gears) since the position of those screws is what allows your bike to shift accurately. Leave those alone. You should also make sure that anything that isn’t intentionally supposed to be loose is relatively secure. Chains stretch, tires wear out, mechanical parts get clogged with grim and stuff just breaks down in general as time and miles get added to your bike. If after you’ve washed a part down it still looks beat up and loose, it might be time for a replacement part. If you’re unsure what “beat up and loose” looks like, ask a mechanic. They’re great sources of knowledge. If this stuff didn’t happen, we wouldn’t be talking about it. But the honest truth is, people miss the major stuff. Wheels not being securely attached. 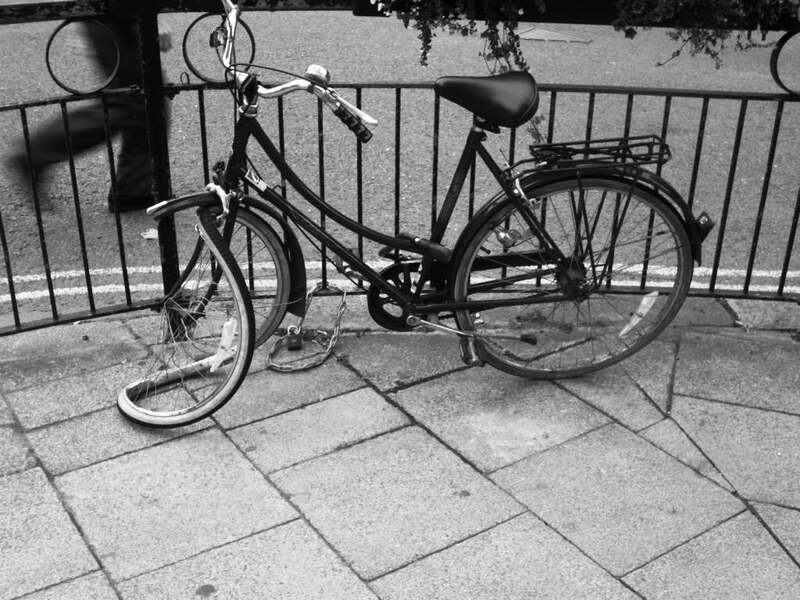 Broken or missing spokes. Only one screw holding a part on when there’s supposed to be five. Frames so damaged that “bent” is an understatement. People have missed these things and ridden on them. Some have gotten seriously injured. Long story short with any bike related safety, know what to look for (minor and obvious) and don’t go against your gut when it says something’s wrong. Finally, when in doubt, ask a mechanic. They’re the doctors of the bike world. Good luck and ride safe. This entry was posted on Tuesday, April 29th, 2014 at 10:00 am. Both comments and pings are currently closed.